There is enough information about HTML5 on the web (and also on stackoverflow), but now I'm curious about the "best practices". Tags like section/headers/article are new, and everyone has different opinions about when/where you should use these tags. So what do you guys think of the following layout and code? line 7. section around the whole website? Or only a div? line 8. Each section start with a header? line 23. Is this div right? or must this be a section? line 24. Split left/right column with a div. line 25. Right place for the article tag? line 26. Is it required to put your h1-tag in the header-tag? line 43. The content is not related to the main article, so I decided this is a section and not a aside. aside – Used for tangentially related content. Just because some content appears to the left or right of the main content isn’t enough reason to use the aside element. Ask yourself if the content within the aside can be removed without reducing the meaning of the main content. Pullquotes are an example of tangentially related content. nav – Intended for major navigation information. A group of links grouped together isn’t enough reason to use the nav element. 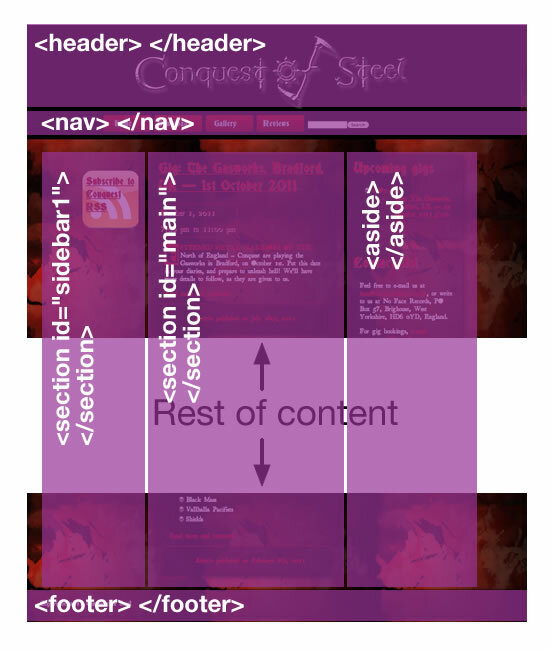 Site-wide navigation, on the other hand belongs in a nav element. footer – Sounds like its a description of the position, but its not. Footer elements contain informations about its containing element: who wrote it, copyright, links to related content, etc. 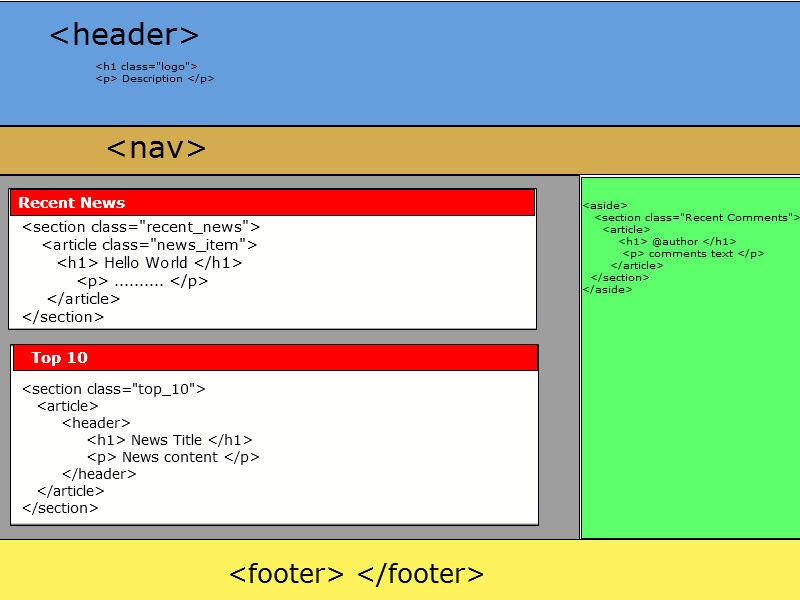 Whereas we usually have one footer for an entire document, HTML5 allows us to also have footer within sections. Unfortunately the answers given so far (including the most voted) are either "just" common sense, plain wrong or confusing at best. None of crucial keywords1 pop up! Concrete answers to OP’s questions. To understand the role of the html elements discussed here you have to know that some of them section the document. Each and every html document can be sectioned according to the HTML5 outline algorithm for the purpose of creating an outline—⁠or⁠—table of contents (TOC). The outline is not generally visible (these days), but authors should use html in such a way that the resulting outline reflects their intentions. What is the difference between <article> and <section>? How do <header>, <footer> and <main> fit in? You may find more information in this article on A List Apart. 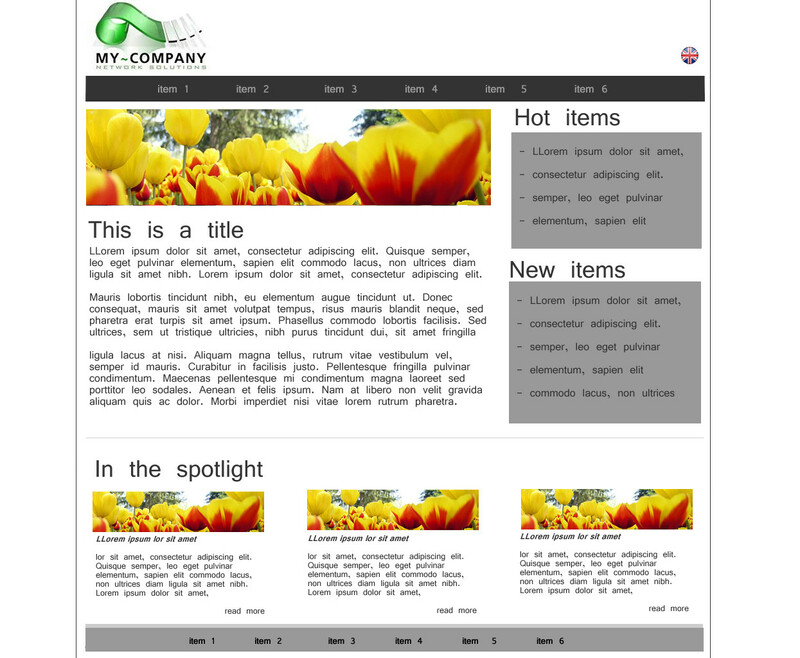 <header> Used to contain the header content of a site. <footer> Contains the footer content of a site. <nav> Contains the navigation menu, or other navigation functionality for the page. sense if syndicated as an RSS item, for example a news item. purposes or subjects, or to define the different sections of a single article. <aside> Defines a block of content that is related to the main content around it, but not central to the flow of it. Let's explore some of the HTML5 elements in more detail. The <section> element is for containing distinct different areas of functionality or subjects area, or breaking an article or story up into different sections. So in this case: "sidebar1" contains various useful links that will persist on every page of the site, such as "subscribe to RSS" and "Buy music from store". "main" contains the main content of this page, which is blog posts. On other pages of the site, this content will change. It is a fairly generic element, but still has way more semantic meaning than the plain old <div>. you may have noticed that we used an <aside> element to markup the 2nd sidebar: the one containing latest gigs and contact details. This is perfectly appropriate, as <aside> is for marking up pieces of information that are related to the main flow, but don't fit in to it directly. And the main content in this case is all about the band! Other good choices for an <aside> would be information about the author of the blog post(s), a band biography, or a band discography with links to buy their albums. So, with all these great new elements to use on our pages, the days of the humble <div> are numbered, surely? NO. In fact, the <div> still has a perfectly valid use. You should use it when there is no other more suitable element available for grouping an area of content, which will often be when you are purely using an element to group content together for styling/visual purposes. A common example is using a <div> to wrap all of the content on the page, and then using CSS to centre all the content in the browser window, or apply a specific background image to the whole content. Neither. For styling: use the <body>, it’s already there. For sectioning/semantics: as detailed in my example HTML its effect is contrary to usefulness. Extra wrappers to already wrapped content is no improvement, but noise. No, it is the author’s choice where to put content typically summarized as “header”. And if that header-content is clearly recognizable without extra marking, it may perfectly stay without <header>. This is also the author’s choice. The <div> is probably wrong. It depends on the intentions: is it for styling only it could be right. If it’s for semantic purposes it is wrong: it should be an <article> instead as shown in my other answer. <article> is also right if it is for both styling and sectioning combined. <section> looks wrong here, as there are no similar sections before or after this one, like chapters in a book. (This is the purpose of <section>). No. A lone <h*> element probably never needs to go in a <header> (but it can if you want to) as it is already clear that it’s the heading of what is about to come. – It would make sense if that <header> also encompassed a tagline (marked with <p>), for example. line 43. The content is not related to the main article, so I decided this is a section and not an aside. It is a misunderstanding that an <aside> has to be “tangentially related” to the content around. The point is: use an <aside> if the content is only “tangentially related” or not at all! Nevertheless, apart from <aside> being a decent choice, <article> might still be better than a <section> as “hot items” and “new items” are not to be read like two chapters in a book. You can perfectly go for one of them and not the other like an alternative sorting of something, not like two parts of a whole. Well, there is no <header>, but the <h2>-heading leaves pretty clear which part in this section is the header. <article> or <aside> might be better. According to the explanation in my “main” answer the document in question should be marked up according to an outline. definitively not what was intended. The main mistake: You have "divitis" in the whole document. More, ...line 63: why header wraps h2?? If you do not include any more element inside header, just use a single h2. Keep in mind, your structure is not to stylize document, but construct a document self-explained. It seems unnecessary to add the wrapper divs. ID values have no semantic meaning in HTML, so I think it would be perfectly valid to do this - you're not saying that the first article is always item_1, just item_1 within the context of the current page. IDs are not required to have any meaning that is independent of context. Also, as to your question on line 26, I don't think the <header> tag is required there, and I think you could omit it since it's on its own in the "main-left" div. If it were in the main list of articles you might want to include the <header> tag just for the sake of consistency. With header tag: NO. Header tag represents a wrapper for page header and is not to be confused with H1, H2, etc. I didn't answer other ones because it's kind of hard to guess what you were referring to. If there are more questions, please let me know. I dont think you should use the tag on the news item summary (lines 67, 80, 93). You could use section or just have the enclosing div. An article needs to be able to stand on its own & still make sense or be complete. As its incomplete or just an extract it cannot be an article, its more a section. EDIT: Unfortunately I have to correct myself. Refer below https://stackoverflow.com/a/17935666/2488942 for a link to the w3 specs which include an example (unlike the ones I looked at earlier on). But then.... Here is a nice article about it thanks to @Fez. suggests to me that section is higher level than article. As mentioned in this answer section groups thematically related content. Content within an article is in my opinion thematically related anyway, hence this, to me at least, then also suggests that section groups at a higher level compared to article. Neither – there is a main tag for that purpose, which is only allowed once per page and should be used as a wrapper for the main content (in contrast to a sidebar or a site-wide header). 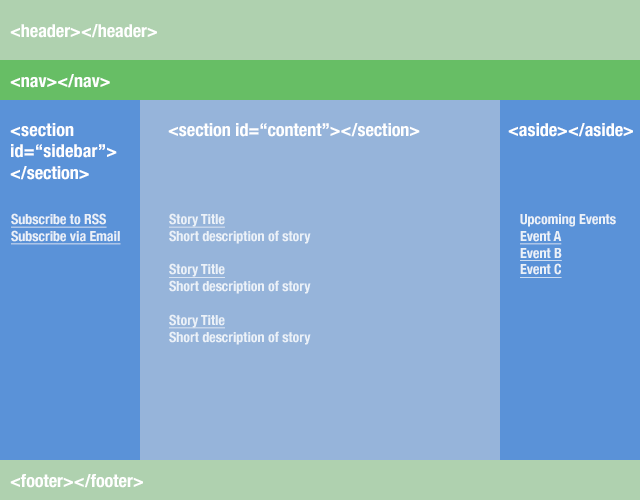 1.Wall comes under "section" tag,which denotes it is separate from page. 2.All posts come under "article" tag. 3.Then we have single post,which comes under "section" tag. 3.We have heading "X user post this" for this we can use "heading" tag. 4.Then inside post we have three section one is Images/text,like-share-comment button and comment box. 5.For comment box we can use article tag. Not the answer you're looking for? Browse other questions tagged html html5 header article or ask your own question. <article> and <section> for forum's topics? Where to use new HTML5 tags? 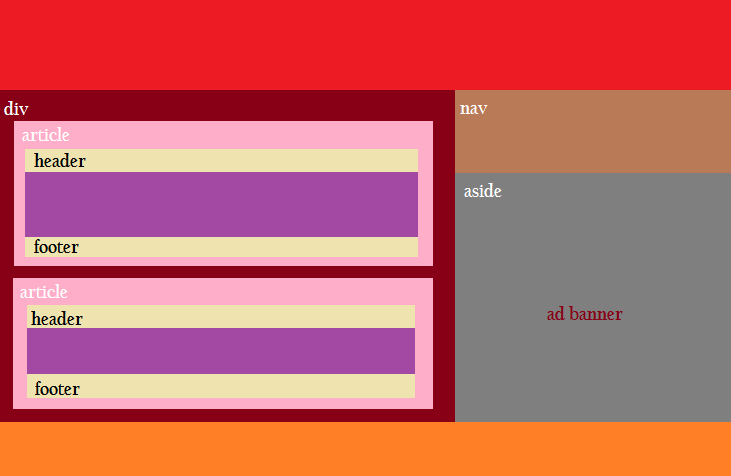 Is this a Semantic HTML5 Layout? Confusion between <article> or <section> tags. Which to use? Can an aside element have only img inside it? What is the best way to indent text in a DIV when it wraps?